The feminist movement is one of the most controversial and conversational issues buzzing around the media lately, including on campus. On Tuesday, Health Services and SHARPP sponsored a women’s expo, offering resources and knowledge to women in the community. At MTV’s Video Music Awards in August, singer Beyoncé’s silhouette stood in front of one smoldering, neon word: feminist. Last week, actress Emma Watson promoted the rising HeForShe campaign at the United Nations New York headquarters. She has since received much backlash for taking her stand as a feminist. It seems that feminism is currently a scorching time bomb, in the sense that it is one of the most controversial and conversational topics on the table at the moment. Why is this movement currently so prevalent in today’s society? There is a crisis regarding what it means to be a feminist.While celebrities have been making bold statements, feminism is happening on a more local level all over the country. With the goal in mind to offer resources and knowledge to females of the community, the event was an abundance of empowerment. Present at the expo were organizations such as Planned Parenthood, UNH Vox, SHARPP, university police, Residential Life, HerCampus UNH, the Waysmeet Center and many more. 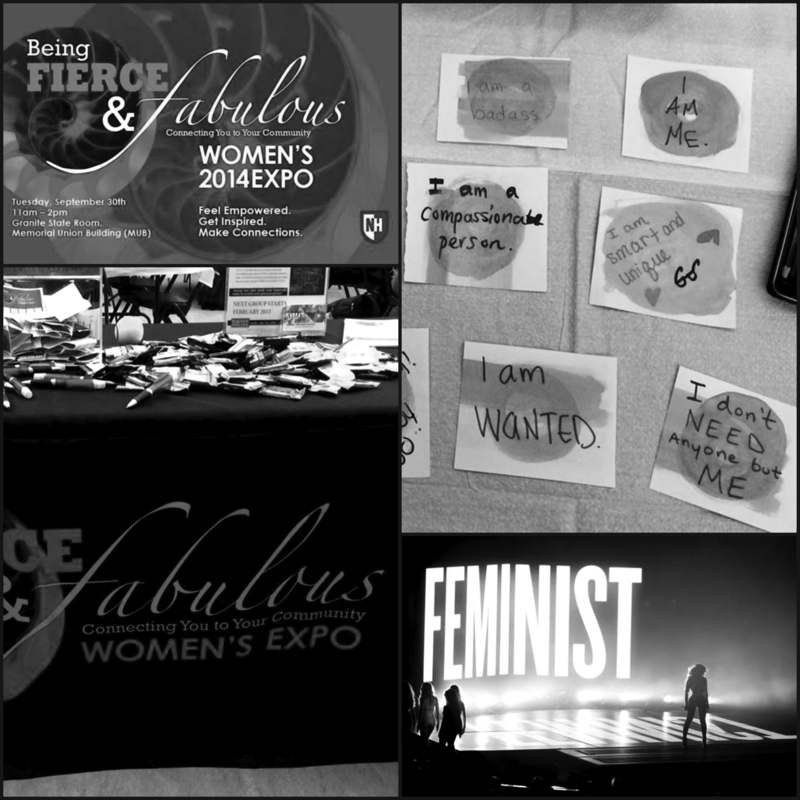 While the event was not intended to address feminism directly, it certainly had undertones of the movement. Junior women’s studies major Cecilia Martins was a representative of the department present at the expo. This being said, we are in a time where being called a feminist can be used as an insult. With feminism filling news outlets and headlines, college-aged women are also pioneering their own movement. The beginning of the 2014-2015 school year has already seen unsettling events occurring on campuses all over the country. Between assaults and abductions, women are paying attention. UNH patrol officer Lauren Andrews has witnessed this change firsthand and notices the increased efforts being made. Andrews highlighted the new mobile app, LiveSafe. Students can utilize this by anonymously sending tips and chatting with police. While calling 911 can be intimidating to some, this is now a way to communicate with the authorities in a more comfortable and conversational manner. Andrews mentioned that many students have been making great use of this mobile app. “Things as simple as ‘A man in the woods is yelling at girls’ have been reported,” Andrews said. The anonymous Facebook page UNH Confessions has been full of blasts against feminists, many of which are written by women themselves. This is the identity crisis. UNH Vox is an organization in which tries to “educate, empower, activate and unite the voices within the community regarding contemporary feminist and social justice issues.” On Oct. 16, they will host “Take Back The Night,” which will feature a campus march and vigil/speak-out about sexual assault and domestic violence. Freshman UNH Vox member Chloe Ford feels their mission is important and fills a purpose.